Another year, another March, equals another Pi day. Last year we looked at fresh vs. store bought pie crust. 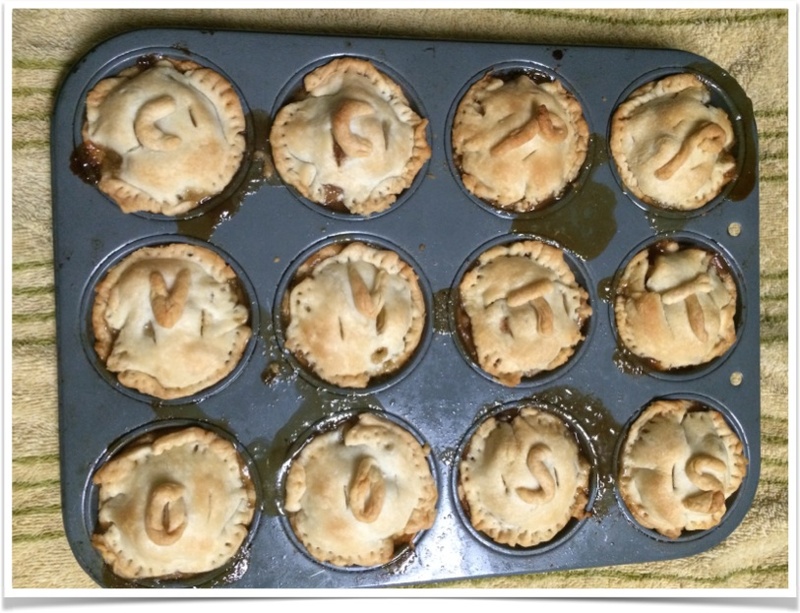 This year we wanted to test some of the various seasonings that could go into pie. In addition to there being various types of cinnamon available for purchase, we were also interested in deviations from the typical cinnamon + nutmeg spicing that is ubiquitous in recipes. To simplify our lives, despite the fact that homemade crust was more awesome than store-bought in our previous test, we used a store-bought crust to line the 12 cups of a muffin tin. Pie-lets were baked at 375°F for 25 minutes, and allowed to cool for 40 minutes. Note: to be consistent, for pinch and dashes we used these for measuring. Saigon Cassia (S) 2 of 3 liked this less than C but more than S strong cinnamon aroma, more subtle than T, warm but not spicy. Possible floral aspects. spicier than C, but without same warmth as T. Maybe more fruity than S.
another thought it was similar to P, but sweeter and slightly cake-y. flavor lingers and hides the apple flavor, maybe amount should be reduced? O3 (O) 1 person’s favorite seems fruitier, although one person wasn’t sure which fruit they were tasting. distinctly different than the others, could pair well with the Ceylon. Comments: Taste testing is highly personal, especially when there are no clear winners. Every taster preferred something different in this case, with two people preferring (different) non-cinnamon variants. The cinnamons were noticeably different, although sometimes distinctions were subtle (e.g. the Saigon and Ceylon were more similar to each other than they were to the grocery store Cinnamon; which was most likely Cassia). The least favorite was the plain base pie, mostly because it was not very interesting compared to the others. However, none of the taste testers would have turned down that pie, and two of which could also recall previously having apples pies that were worse than the plain version tested today (one story involved a garlicky apple pie… it was unknown how that came to be, but it was known that pie was not finished). We would like to explore the orange liquor variant of apple pie more fully (perhaps with a brownie-style test), as it was intriguing, even if only one person claimed it as their favorite at this point. Thanks for reading! Happy Pi-Day! 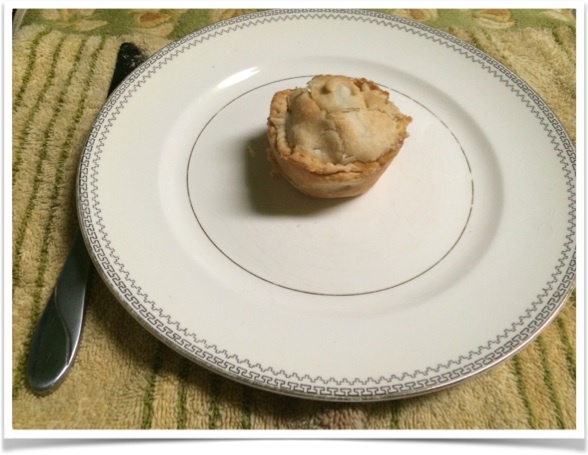 A single pie-let, ready for tasting.